Pope Benedict XVI once again denounced the ordination of women and the abolition of priestly celibacy in the Roman Catholic Church during a stern Holy Thursday address. Delivering his homily this past Thursday in St. Peter’s Basilica, Pope Benedict said the ban on female priests was a “divine constitution,” as Jesus chose only men to be his apostles during the Last Supper. Surrounded by more than 1,600 priests, bishops and cardinals, the Pope stressed that he would not tolerate disobedience about these issues. 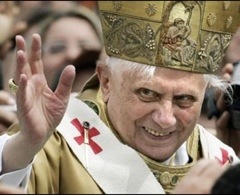 With all due respect, Pope Benedict is blind to the realities of the early Apostolic Church. And far too many highly-placed contemporary Church leaders spend more time reading L’Osservatore Romano than they do reading the signs of the times. Very early in the history of our Church, there was a conviction that what Jesus taught and did should be faithfully remembered but not necessarily repeated in all the forms in which the first disciples received it. Apostolic imagination and institutional creativity in the post-Resurrection Church. (1) By Baptism, in the Christian community, Gentiles were accepted as equal to Jews. (2) A New Testament was written. (3) Four different Gospels interpret Jesus Christ in four different theologies. (4) A sacramental system is created with great fluidity and a variety of rituals. (5) A plurality of ministries emerges based on individual charisms and community approval. (6) Paul, who never met the historic Jesus is considered an apostle. The processes of theological and structural creativity continued into the post-Apostolic Church. (3) The Roman Papacy became an authoritarian power structure. And the process continued…….and continues…..and must continue. Long ago I learned the old principle of Catholic life: “Ecclesia est semper ipse sed numquam idem.” (“The Church is always itself but never the same.” That should be emblazoned on every bishop’s coat of arms! Resurrection is about on-going new life. On-going Apostolic Imagination. I keep pointing out to all who perpetuate that myth about Jesus only choosing men that it was Mary Magdalene to whom He first appeared after the Resurrection and it was HER to whom He said- “Go and tell the Good News.” More need to read the Gospel. As for the Last Supper. Just who do the naysayers think cooked all that food? If those who disqualify women would just ONCE bother to inform themselves about Jewish observance of the Sabbath and Passover they might find out the truth. Which is that the Mother (or other female head of household) opens the Sabbath/Seder meal with the blessing of the candles. If we accept that Jesus was Jewish and practiced His faith perfectly, the presence of women at the Passover meal follows. It breaks my heart that the hierarchy is more concerned with retaining power than with speaking Truth. If only more would understand the WE are The Church. Not the power brokers. Not the male dominated rule makers (who so remind me of those of whom Jesus said “They put a burden on the shoulders of the people and lift not a finger to help them) – The Church- IS- the Body of Christ- and that is US. Well done indeed! Mary of Magdala was the first follower “officially sent” by Jesus with the commission of telling the Good News of the Resurrection. This makes her an Apostle from the Greek word apostolos, or the verb apostolein “someone not just simply sent, but “officially sent” carrying the authority of the one who sends. As Raymond Brown pointed out repeatedly, the “Twelve” were not ordained priests, let alone bishops, and they had no connection with the modern priesthood. They were meant symbolically to represent the 12 tribes of Israel that Jesus had come to reform. Aquinas said that a thing is received according to the mode of the receiver. IOW, we see what we want to see. If the filter is the protection of one’s power, prestige, and authority, the status quo, that is how everything is processed. Anything that does not fit raises alarms, followed shortly by threats. It seems almost like a feeble dying gasp. The silencing of the two Irish priests for speaking out in support of ordaining women is very disturbing, even though it is obviously how Jesus would act if he had all the facts. The Pope and the Bueracracy at large would do well tro remember that even they don’t consider priests as apostiles, they have reserved that right only for the Bishops. To claim women can’t be priests is to say the are theologically infierior to men, and even worse that the Holy Spirt said everything we needed to know 2000 years ago. If they truly believe that the Holy Spirt is dead then everything the preach is simply a lie. The Magisterium is the worst of all of the Hypocrites. I know this sounds bad but……destroying the “church” maybe the only way to save the faith. 2000 year of collecting money and building, yet the same problems persist. It is time to get back to basics and teach our children that curch is not a place you go, it is a way you live your life. As Paul said, faith is not enough, a life lived out of love for others is the path to salvation. If we listen and obey what a small group of old single men say we are missing to much of what is possible. The Holy Spirt is not constrained by religous organizations created by man, political parties, or national boundires. The fact that we even speak of the “American” or “Asian” BIshops or Church is contrary to what we profess as a beilief. There is only one true God, regardless of whay name we use, salvation is for all, and for “many”.